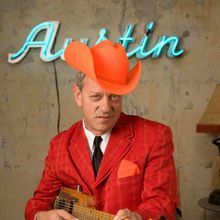 Though these two quotes attempt to explain his uniqueness and wide range musical capability, though not vague, the quotes are so dissimilar as to provoke a curious sense of mystery for a reader uninitiated with the phenomenon known as Junior Brown. Of course, to anyone who has seen Junior sing and play live, or heard any of his ten albums, will no doubt understand the connectedness in what the two quotes mean, and more often than not will have some quotable Junior observations to add of their own. 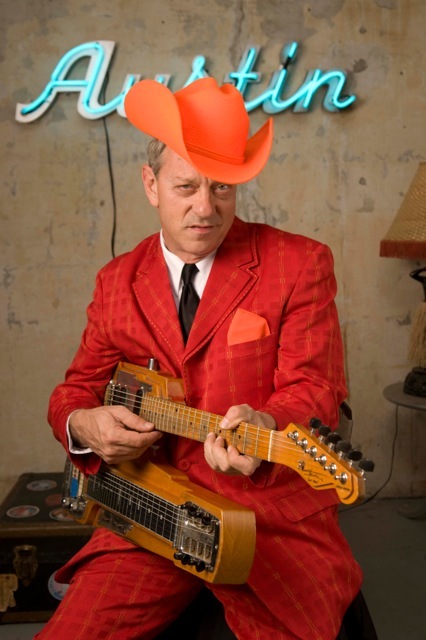 What it all boils down to is this: with his unique voice, more unique songwriting craft, and even more unique double necked “Guit-Steel”, there has absolutely never been anyone like Junior Brown. Born 1952 in Cottonwood, AZ., Junior showed musical talent at an early age playing little melodies on the family piano before he could talk. Curiosity led him to an old guitar in his grandparents’ attic, thus setting the stage for a lifelong interest in the steel strings. After a series of high school dance bands, he hit the Country dance club circuit full time while still in his teens. This continued for decades all over the United States and many excursions abroad. After settling in Austin, Texas, with his wife and rhythm guitarist-singer, Tanya Rae, he began his weekly tenure at the legendary Continental Club where the band successfully honed their craft leading ultimately to a major label signing (Curb), a Country Music Association Award (CMA), three Grammy nods, a Bluegrass Music Association Award (IBMA) with legend, Ralph Stanley, duets on record and video appearances with everyone from Hank Thompson and George Jones to The Beach Boys and Stone Temple Pilots. Then came movies (Me Myself and Irene, Trespass, Still Breathing, The Dukes of Hazard, Blue Collar Comedy Tourl and II), TV shows (X Files, Chris Issac, Austin City Limits), multiple appearances on Letterman, Conan, Saturday Night Live, and even a cameo appearance in SpongeBob Squarepants. And there were the national ad campaigns, like The Gap, Lee Jeans and Lipton Tea. Lately Junior has been concentrating just as hard as always on his songwriting skills with his more recent material, which still references dry wit, serious sentiment and instrumental prowess. So what more does one say in an attempt to describe a truly one-of-a-kind music legend, who is doing what he does better now than ever before? How does someone describe the indescribable to one who hasn’t seen or heard? What comes to mind for me is the title to one of Junior’s early albums which refers cleverly to his creation, the “Guit—Steel”, the instrument consolidating standard and steel guitars allowing him to switch mid-song between the two while singing. The title of the album simply states the best advice that can be offered: GUIT WITH IT!